Do you gloss over your laundry/linen/utility room? You shouldn’t. The space is a great way to organize your laundry, linens and more home storage so that you will have a relaxing, peaceful place to do laundry or conduct projects in here in Norfolk, Yorktown, Poquoson, and Newport News. To get a purposeful space, it’s important to have plenty of storage. Cabinets and shelves store laundry detergents, cleaning supplies and towels, among other miscellaneous household items. 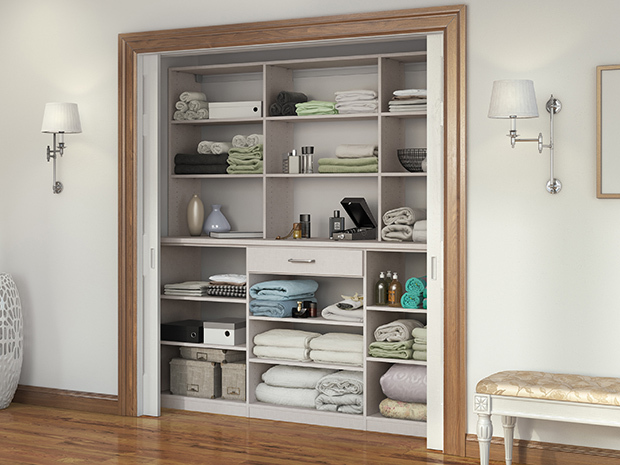 Doors and drawers provide concealed storage for an orderly look. With plenty of sleek cabinet space, a laundry room can become both sleek and efficient. Baskets and bins to make sorting laundry easy. Pullout racks for linens and vertical shelf dividers for mops, brooms, and cleaning supplies to organize often-used items. A pullout ironing board that swivels and folds out into the space and tucks away out of sight when not in use. Whether you envision your laundry room as being a functional storage solution or a serene spa-like ambiance space, there are plenty of design options to draw inspiration from. Laguna Laundry Room – Blending clean lines, ample storage and a simple workspace, this functional room provides efficient organization. Adjustable shelving creates flexibility for changing needs. Hoboken Laundry Room- Custom-designed cabinets, complete with crown molding, gives this chic laundry room a built-in look. Brushed Aluminum decorative hardware adds polish. Simple Linen Closet – This straightforward storage configuration provides organization for sheets, blankets and other necessities. A floor-based system with toe-kick offers accessibility. Scottsdale Laundry and Craft Room – Thoughtful design and details create multiple functional spaces that add purpose to a small room. Puck lighting illuminates workspaces and highlights display items, and a Fusion Track Wall System with accessory hooks offers storage for supplies. Get started today with a complimentary in-home expert design consultation by contacting the California Closets Virginia Beach team. 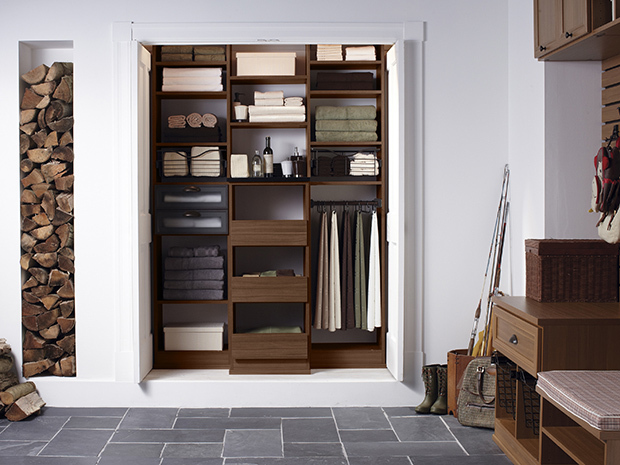 Featured on Houzz, California Closets has been the leading closet and storage designer for nearly four decades.